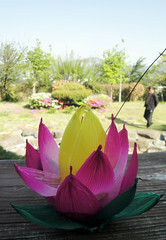 Ulsan tends to get a bit of a bad rap amongst foreigners in Korea. This is why they’re all wrong. 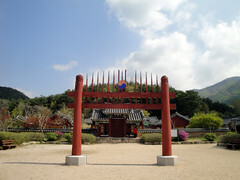 Ulsan is Korea’s whale meat capital. 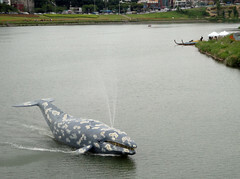 The whale festival was an interesting, quirky celebration of the tradition and its history. 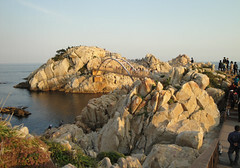 One of the “12 scenic sights of Ulsan” (and my favorite so far) is the pine forest at Ilsan Beach. What’s so good about a forest of pine trees? Everything, actually. 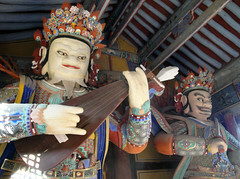 Tongdosa is one of the three biggest temple’s in Korea, and one of my favorites. I think it’s technically located in Yangsan, or between Ulsan and Yangsan, but it’s reachable by Ulsan’s city buses. The temple is beautiful, with some nice hikes in the surrounding hills, and a great little restaurant that brews its own beer. A return to Tongdosa to check out the Birthday decorations and do some more hiking, where we stumbled across some more temples and found some peace and quiet. Also, more beer! The sixth grade went on a field trip to this tiny memorial in the boonies of Ulsan, where my co-teacher and I stumbled upon a beautiful little temple run by a friendly German monk. Ulsan in fall is a pretty place. My first three months in Ulsan took me to the onggi pottery village, the bamboo forest, the rather unexciting Seonbawi, biking to Bangeojin, and all around downtown. 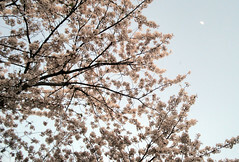 My first exploration of Hakseong Park, one of the city’s few parks not along a river.